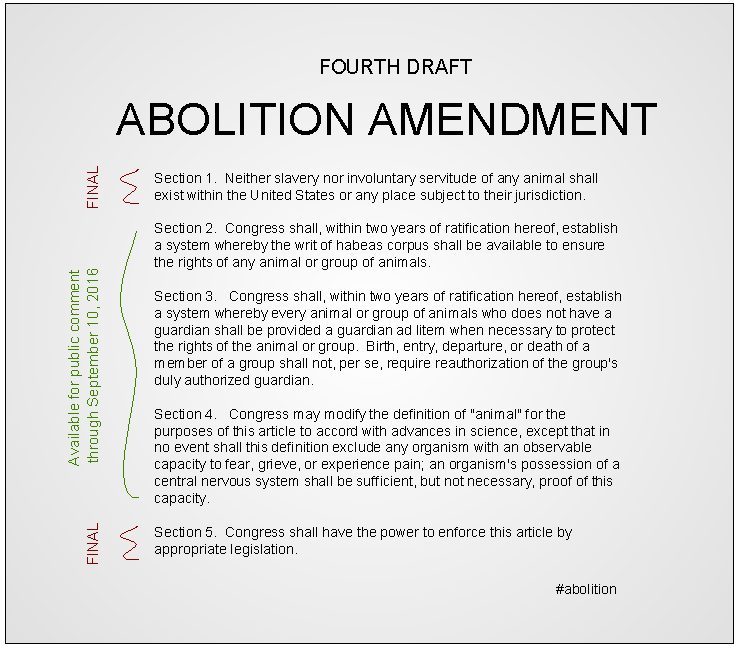 Summary: The Humane Party has published the fourth full draft of the Abolition Amendment, a proposed amendment to the United States Constitution. Upon ratification, the Abolition Amendment will immediately abolish the property status of all animals under U.S. jurisdiction, thereby ending the dairy, egg, meat, poultry, leather, fur, vivisection, and other exploitation­-based and killing-­based industries. The Humane Party, a political party in the United States, has published the fourth full draft of the Abolition Amendment, a proposed amendment to the U.S. Constitution. Upon ratification, the Abolition Amendment will immediately abolish the property status of all animals under U.S. jurisdiction, thereby ending the dairy, egg, meat, poultry, leather, fur, vivisection, and other exploitation­-based and killing-­based industries. The current draft of the Abolition Amendment will now be available for comments, criticisms, and editorial suggestions from the public through September 10, 2016. If necessary, the text of the Abolition Amendment will then be revised again in light of comments received and published again for another thirty-­day public­-comment period. Publication of the final draft of the Abolition Amendment is scheduled for American Abolition Day (December 6) 2016. Comments on the Abolition Amendment may be submitted by way of the Humane Party’s main website at http://www.humaneparty.org or its social media page at http://www.facebook.com/humaneparty. The Humane Party’s announcement comes approximately four weeks after closing of the public-comment period for the third draft of the Abolition Amendment. The text of Sections 1 and 5 has now been finalized, leaving Sections 2, 3, and 4 still available for public comment, criticism, and editorial suggestion. The present draft clarifies additional parameters for Congressional implementation of procedural mechanisms to protect animals (including habeas corpus and guardian ad litem). Additionally, the present draft clarifies the boundary for Congressional modification of the definition of the word “animal” in the future. Section 3. Congress shall, within two years of ratification hereof, establish a system whereby every animal or group of animals who does not have a guardian shall be provided a guardian ad litem when necessary to protect the rights of the animal or group. Birth, entry, departure, or death of a member of a group shall not, per se, require reauthorization of the group’s duly authorized guardian. Section 4. Congress may modify the definition of “animal” for the purposes of this article to accord with advances in science, except that in no event shall this definition exclude any organism with an observable capacity to fear, grieve, or experience pain; an organism’s possession of a central nervous system shall be sufficient, but not necessary, proof of this capacity.